The Universal Declaration of Human Rights proclaimed in 1948 explicitly calls out the importance of arts and culture. Article 27 states “Everyone has the right freely to participate in the cultural life of the community, to enjoy the arts and to share in scientific advancement and its benefits.” This estimable document includes a number of essential rights, like the right to life and work. Amongst those foundational needs, everyone has the right to knowledge and culture. The importance of intellectual and cultural pursuits might be seen as a right by the United Nations but are often unfunded mandates in many countries. In the US, arts and culture funding generally combines private and public funding like a complicated crazy-quilt. A patron at a library, theater, and/ or museum would be hard-pressed to perceive the sources of money that keep the lights on and the culture coming. Arts and culture seem to just be there. The opacity of funding can be a sincere challenge in building ownership in patrons as well as maintain sustainability. Patrons need to understand costs if they are being asked to help pitch in. National Public Radio (NPR) offers a useful model of articulating the actual cost of services. During funding drives, most stations delineate the costs and then remind listeners of their responsibility to pay for what could be free. Breaking down costs concretizes services that otherwise seem ephemeral. Visitors often do not understand the true costs of running arts or cultural organizations. Museums and arts organizations support their funding mostly through large donors, who basically subsidize the low-cost or free entrance. So, the visitors are merrily ignorant of the hard work the development staff engages in daily. They see the benefits of this labor as a given. Alternately, many performing arts organizations have a different model. Patrons pay fees for tickets. These fees do not completely cover the operating costs. But, patrons understand that there is a cost associated that that cultural experience. The distributed funding model in performing arts exposes the funding needs to a broader sector of their community. Value has a complicated relationship with cost. For example, if the value is seen to be less than the cost, the patron will likely be deterred or disgruntled. If the value is perceived to be more than the cost, the person will be thrilled to make the payment. But value is not just about getting a steal. Value can grow over time. Repeated contact can be necessary to really appreciate some costs. Gym membership, for example, is a cost that you might need a few months to truly appreciate. Which cultural activities do Brits think are “posh”? Onboarding is, therefore, a major problem for the field. Entry programs, often through schools, can help people gain an appreciation of arts and culture. However, if these programs are not valued in their family, students often do not grow to value arts and culture in the long term. Families often preference other leisure pursuits, even if those have costs, unlike the free arts and culture. All is not lost, of course. Arts and culture appreciation can grow in young adulthood, often through friends. However, young adulthood is a time of high student loans and low disposable income. So, young adults might not experience arts and culture enough to build a sustained habit. Free programs, therefore, can be a way to build broad audiences. As one cultural professional said “[without free programs], I think our audience would be even more middle-aged and middle-class than it is, and I don’t know that it would have the chance to diversify, both in those terms and in others.” Free programs are the easiest way to break down a tangible access barrier. Free allows anyone and everyone to enjoy the benefits of arts and culture. Arts and culture are also often best enjoyed collectively. A live reading of a poetry is different than listening to an audiobook at home. Live theater allows patrons to connect not only to the story but also to the energy of being in a room full of like-minded individuals. When a social group goes to an exhibition, they can learn and explore together. Arts and culture are also cost-effective when experienced collectively. The cost of mounting an opera is exorbitant, and so sharing those costs are the only way that such experiences can exist. Real Rembrandts, and frankly many fake Rembrandts, are too costly for most people to own. Most people’s chance to experience high-quality art is in art museums. As, the power of experiencing arts and culture, though, is not universally obvious, free opportunities allow people to tap into these experiences of collective learning with authentic arts and culture. Value and cost, therefore, have a convoluted relationship. These organizations are seen as exclusive. Charged fees support the perception of exclusion. The real costs of running these types of organizations are often invisible to users. However, most people do not place enough value on these resources to pay even a portion of the cost. After all, even when available free, these arts and culture amenities are often eschewed for costlier options. When free programs are valued, patrons grow a deep appreciation and donate funds. The rights to art and culture are one that is not universally appreciated. There is no single way to run arts and culture nonprofits to help patrons understand their value. Broad social appreciation of these fields is required to sustain audiences. Costs can be an access barrier, certainly, however, fees can also signal value to patrons. Availability can be a way to grow engagement or a means of building engagement. However, the salient issue here is about perceived value. In order to maintain the arts and cultural sector, writ large, the social value has to be clear to potential patrons. These programs have to appeal to patrons (rather than organizations). In other words, the arts and cultural sector cannot expect to draw new patrons (or even existing patrons) by maintaining the status quo. They need to find better ways to express their value to their local community while also working nationally as advocates. Taken from the Marvel Comic Books, the Black Panther is a movie about a fictional African nation that cloaks its advanced civilization as a form of self-preservation. The king of the nation has superhuman strength thanks to serious sumptuary success. The Black Panther’s trail to bring a bad guy to justice starts some even worse experiences for him and his nation. While the Black Panther mentions slavery, colonialism, appropriation, and the art market, they are in support of a great story. Certainly, the many challenges in the history of the African diaspora are worthy of exploring in film, as well as literature and exhibitions. But, people of color are not just the sum of the worst of their history. Black Panther told a great hero story, using all the elements of the character’s history, good and bad. But, this is a really an adventure romp. In other words, don’t essentialize POC’s experiences in exhibitions or programming. Appeal to the whole people if you want their whole participation. Disney put real money into the marketing, and their investment was returned by being the fifth biggest box office opening domestically. Museums often split up their marketing with the smallest part going to education programs and diversity programs. And, then people don’t come. If these people are the hardest to get, you probably need to try the hardest to get them into your doors. The Black Panther will be in the upcoming Infinity War, apparently. Most Black Panther audiences know this because the ad ran before the movie this weekend. Every person who liked this movie saw that. Some portion might even attend that movie as a result. That said, not every person in the theaters this weekend is a Marvel fan. Many came out to support a Black-led and performed film. But, the synergy is a classic Hollywood trick. Snag extra audiences by pushing products in existing audiences. Museums often sell hard to a sector of an audience for specific exhibitions, like African-American audiences for an exhibition of Kerry James Marshall or young boys for an exhibition of Dinosaurs. That is good marketing sense. But, most museums can do better about cross-promotion. Look for ways that you might find connections to other parts of your collection. Offer them some connected ways to maintain a relationship with your organization’s collection. The Marshall attendees might love figurative painting. The Dinosaur boys might like whales. To find the best synergies think broadly, don’t essentialize people, and consider doing some evaluations of audiences about other interests. There is one scene in a museum where a woman (curator, marketing manager?) is standing in a gallery (with coffee!) nearly apoplectic when being accused of cultural piracy/ theft of artifacts. There are many tougher issues about race that are brought up in this movie, though woven into the narrative. I remind you that this is a Disney blockbuster movie being advertised during the Olympics. Controversial issue and blockbusters don’t need to be in opposition. In fact, if you avoid controversial issues, you might find that you have alienated audiences making for a far-from-successful blockbuster. Disney worked to create a film within the Marvel universe that worked for the audience, and then made sure people knew what they were getting. It’s right in the name, “Black Panther”. This was not the African-American panther (not to mention he is meant to be from Africa). This story was pretty honest about race, but also matter of fact. From the advertising alone, no one thought that they were going to be seeing one or two black faces. But, at the same time, it was not just about race. You didn’t forget their color but you let the Black Panther, his enemies, his friends, and everyone else in Wakanda be their whole selves. Museums in general still make the mistake of essentializing people of color, particularly black/ African-American people. Coded language flourishes in museums and museum culture. The word “diversity” in most museums means, not variation as it should, but instead moves to include black people or people of color in the museum ecosystem. This is a terribly bad way to grow audiences. You are basically inviting people in to change your demographic but not changing for them. What happens, then, is that you don’t have true change in museum demographics. Black Panther showed that people of color will respond to quality entertainment that is more than about race as long as it doesn’t shy away from Race. Also, this was not a sneaky move to create a movie that had an almost all-black cast. This was all-out, right-on Black made and performed. Museums can learn bringing people in, different people than you have now, requires real effort, real money, and a truthful product. After all, if you aren’t planning to go big, people will just stay home. Don’t believe me, ask the people who didn’t stay home this weekend. And if you were here for the art, here are 12 artworks from cultures that inspired the Black Panther designers. The arts and culture present some serious funding challenges for society and represent some serious inequities. The top of the pyramids, like the directors of museums or the owners of galleries, make much more money than those starting out. Many people cannot afford to work in the arts because of the low salaries. Therefore, arts and culture often draw from upper middle class and upper-class sectors for staffing. Donors give more money than the average customer. However, donors and other upper middle class/ upper-class disproportionately consume the arts. Arts and Culture are often too expensive for the middle class and lower middle class. Institutions serve more people than they employ, meaning that while there isn’t large “profit, there is increased engagement. So what? Well, it means that when arts and culture have inequity in their means of production, the public will question our costs. Art, for example, is a commodity. People know that works can cost millions of dollar. When museums suggest they need money to support their operations, this doesn’t compute. Arts and culture are extremely costly to produce. Think of all of the people who need to paint sets for Broadway show, and this is not work that can be automated. And, while people might enjoy that show, they can’t see how the cost of painting that set goes into the ticket fee. They just see that they will be spending $200 of their hard earned money for a 2-hour show, for example. You don’t realize that your ticket is not even close to covering that set painter; the corporate donations are part of this. Obscuring the cost of production means that consumers don’t understand the importance of their contributions. The inequity on the production side also has major problems. Arts and culture of all kinds have expanded drastically. The required contribution from consumers has increased to cover these costs. But, finally, the perceived value of these experiences has not necessarily increased. There is more and more competition for the same consumers, just as they are less likely to go to events. In other words, organizations now cost more while often getting fewer consumers. Arts and Culture need to make more to cover their higher costs but people are not necessarily more likely to spend it. Finally, the opt-in fee to start using arts and culture prices out people, meaning that a whole generation of potential future clients might miss out. The inequities in our funding of arts and culture can have massive ramifications on the number of future consumers potentially rotting the future of the sector. The Danish word hygge is hard to translate. Books like the Little Book of Hygge, often translate the word as coziness. These authors go on to share how that word is but a scarce approximation of its actual meaning. This Danish cultural norm, a sort of way of being, is central to that nation’s high level of happiness. Currently Pinterest is alight with hygge with pictures of arm knit blankets, roaring fires, and mugs of warm coffee. Strictly speaking, hygge is about home life, but there are certain tenets that could help make art museum’s more appealing. Sanctuary is a place of refuge or safety. Art museums can feel like a sanctuary for those who already feel comfortable there. But, there are unspoken codes of behavior. Innocently point at artwork and you might catch the ire of a guard. Bring a selfie stick, and you will meet another guard. Should you wish to find a restroom, you will likely need to find another guard to help you find the way. The signs are so subtle that they fade into the background. In many ways, the challenge for museums is that they are only sanctuaries for those who are already initiated. Yet, most museums profit, both fiscally and culturally, from attendance. So, how can they help others see these spaces as a sanctuary? Belonging is a central element in hygge. When you belong, you feel comfortable participating in the experience. Belonging is hard for museums, in certain ways. Museums has many special interest groups, starting with the trustees, and moving down to the members. These groups often revel in their connection to the museum, and why shouldn’t they, as they paid for the privilege. 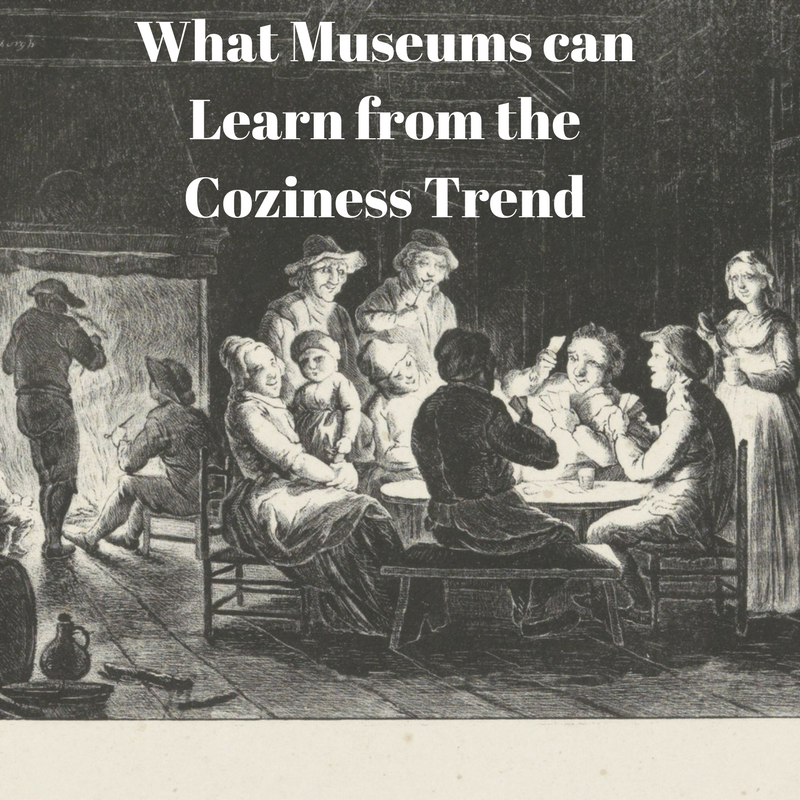 How can museums make all people feel like they belong in the museum community? This is the big question for museums. There is no one golden bullet, oh if there was. But, there are small steps. Let’s go back to the guards. They are basically the hosts to this party. They spend more time with the visitors than any other department. The Walker Art Museum has a wonderful staff, dressed in t-shirts and broad smiles, who makes sure to place welcoming visitors and safeguarding the art as equally important. The human touch is essential in hygge. Think about your most convivial moments in life. There was the food, the décor, the music. Or was it the people, their stories, their laughter. People turn settings into stories. In large spaces, the quality of human interaction is dissipated. In intimate, human-sized spaces, you can engage with people in direct ways. This is the same with art. Small spaces encourage connectivity. For better or for worse, I became an art historian because of the Cloisters. In high school, I trekked to see the oil paintings in their glory. 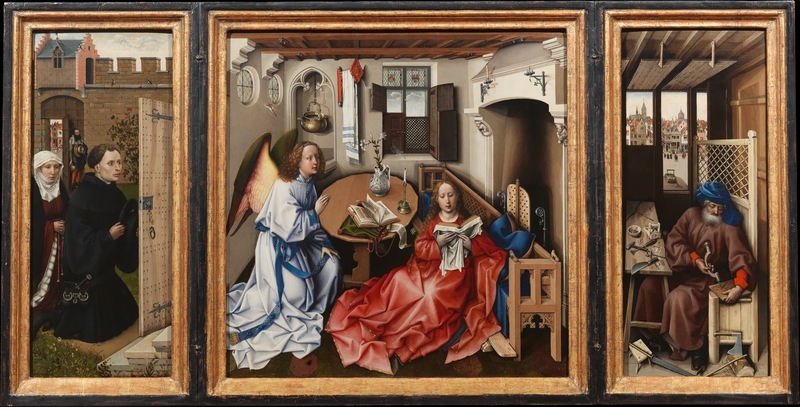 I still remember stepping through a tiny door into an irregularly shaped room to gaze upon the Merode altarpiece. This small work, resplendent in its workmanship, seemed to fill the space. Human scale is not just about architecture. Few museums have the architecture of the Cloisters. Human scale is also about choosing to employ the space in ways that focus on people. Seating groupings imply that one should linger. Legible labels, rather than tiny print, implies that one should read. In its essence, hygge is about setting the stay for most people to have an enjoyable experience. In many ways, most art museums focus on installing art with an eye towards education and learning with little concern for the visitor’s pleasure. Yet, how can people learn if they don’t linger?